The Council on American-Islamic Relations is up to its usual assault on the discussion of Islam. Its Philadelphia chapter is holding a press conference on March 17 at which it plans "to announce the launch of a nationwide campaign to challenge anti-Islam bias in a series of children's books that the Washington-based Muslim civil rights group says promote 'hostility toward Islam and suspicion of Muslims'." I've been given the entire order list for this series (orders that came in up until yesterday). This list shows which school districts and libraries have purchased the individual books or entire series - It is a nationwide campaign. This is valuable information because we can contact each of them and explain that they really got propaganda. I'm not sure what legal issues there are here - but there has to be some sort of thing about masked propaganda in schools and libraries? Karen Dabdoub of CAIR's Cincinnati chapter replied later that day that she shared Khawaja's concerns. Good call Sr. Karen, the names do sound like that...one of them sounds almost Serbian/Romanian. It sounds like everybody that has a beef with Islam is producing books to brainwash the youth with for the next generation. This is really hateful and would be like Neo-Nazis writing books to teach about Judaism in Public schools. Comments: (1) This episode raises unsettling questions: What is CAIR doing with an "informant" inside Mason Crest Publishers? How many other publishing houses has it penetrated? And which other cultural institutions have staff more loyal to CAIR than to their employers? Mar. 17, 2010 update: CAIR held its press conference today, and it was not much of an event, lasting about 13 minutes and involving an audience of about 10 mostly hostile participants. 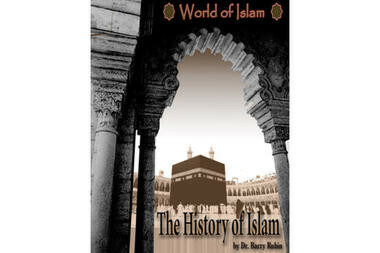 The History of Islam offers only a stunted glimpse of Islamic History and focuses primarily on extremism and contains an outrageous quote: "Today, the great majority of Muslims accept the idea that jihad means a struggle against non-Muslims to increase the area under the rule of Islam." So the great majority, meaning what, above 75%, believe jihad means to fight non-Muslims? That's not true, that's the great minority, Al-Qaeda, who is an enemy of us all. In fact the true meaning of jihad is to struggle with oneself in order to do good deeds. It's amusing that Khawaja is outraged by this quote from the series, for its definition of jihad is perfectly correct; accepting this definition makes one a Muslim, not a member of Al-Qaeda. As for the 75 percent figure, I can't vouch for it but it strikes me as eminently reasonable. Questions from the audience concerned such matters as the books' presence in schools and libraries, FPRI's relationship with Mason Crest, Michael Savage's banning from the United Kingdom, CAIR's organizational reach, Saudi funding for CAIR, and the massacre of Christians in Nigeria. One question followed up on my report, asking if CAIR has a problem that "some of the names that appear as authors happen to sound very Jewish." In reply, Khawaja brazened it out, saying that the only the "content of the books" are at issue. Finally, realizing that questioners would continue to challenge him and his organization, Khawaja aborted the press conference. Mar. 18, 2010 update: Bryan Schwartzman of Philadelphia's Jewish Exponent asked Khawaja about the e-mails that I made public and "Khawaja declined to comment on the authenticity of the e-mails." In my book, "History of Islam," CAIR quoted a passage as follows: "Today, the great majority of Muslims accept the idea that jihad means a struggle against non-Muslims to increase the area under the rule of Islam." Note that it doesn't say that they are favorable to such a step--though polls indicate a lot of them are--or are trying to implement it but that they understand this is what it means. Of course, the "struggle for self-perfection" idea is also there but does not negate the point made above. Still, CAIR was only able even to claim this was somehow objectionable by omitting the following sentences: "But they had for many years treated it as an archaic concept, something not suitable for the modern world. In contrast, Islamists seek to use jihad to mobilize revolutionary forces for violent struggle." The idea that Islamists are trying to use a violent jihad to overthrow governments and launch attacks is hardly controversial, is it? Among the hundreds of people cited in the bibliography is one article by Daniel Pipes, whom CAIR doesn't like because of his effectiveness in critiquing them and their Islamist movement. This is, of course, an attempt to "blacklist" specific scholars who CAIR doesn't like. I refuse, and so should everyone, to omit citing a scholar's good article because that individual has been put on a boycott list by any group. But aside from the quality of the work cited—which should be the only criterion used—the idea that finding one person you can slander among hundreds "proves" horrible bias defies every logical principle. Rather, it reveals the dishonest behavior of the accuser. Mar. 24, 2010 update: Stephen Schwartz puts this incident into perspective today at "CAIR Attacks American Educational Book Series: Business as usual for the Islamists" and writes of the series: "These texts are neither prejudicial nor ideological; they represent established historical opinion and accurate reporting on present-day challenges affecting Muslims and non-Muslims alike." Schwartz concludes that "CAIR is attempting, as often in the past, to reinforce its claim to be a privileged interpreter of Islam in the United States."